My friend’s daughter was celebrating her 10th birthday with a gummy bear themed and asked if I could create something for that. 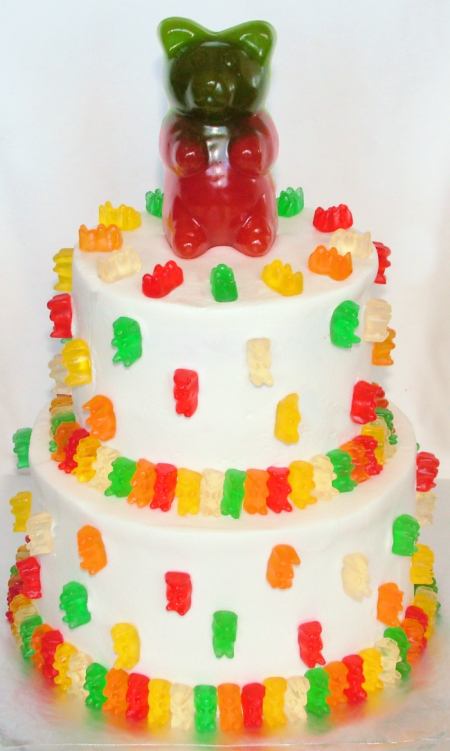 We contemplated a few ideas (including one that involved covering the entire cake with gummy bears, which would use almost 4.5 POUNDS of gummy bears! ), but in the end we decided to go a bit less, since we figured everyone would pick most of the bears off and trash them anyway. She found a giant gummy bear on a stick from World Market that we used on top. It really finished it off! This cake is a 6″/8″.